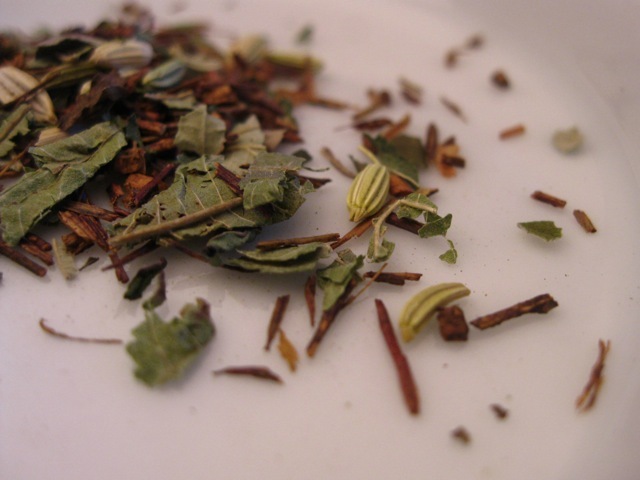 A soothing herbal rooibos with licorice root, fennel, peppermint and lemon verbena. Naturally caffeine-free. When Mrs. Potter Palmer (Bertha Honoré Palmer), the well-travelled and powerful Chicago socialite, first set eyes on Sarasota in 1910, she proclaimed ‘Here is heaven at last’. She soon owned 80,000 acres of what is now Sarasota County, operated a successful ranch, and made her graceful winter home and gardens at The Oaks on Historic Spanish Point. Sarasota County celebrates the 2010 centennial of her arrival and honors the significant impact Mrs. Palmer made on our culturally rich and prosperous community. Please join us in raising a cuppa Bertha Palmer Centennial Tea to this incredible woman! I love licorice and I like peppermint, but I don’t always like the two flavors together. Sometimes it works for me while others it does not. With this tisane, it works very nicely! 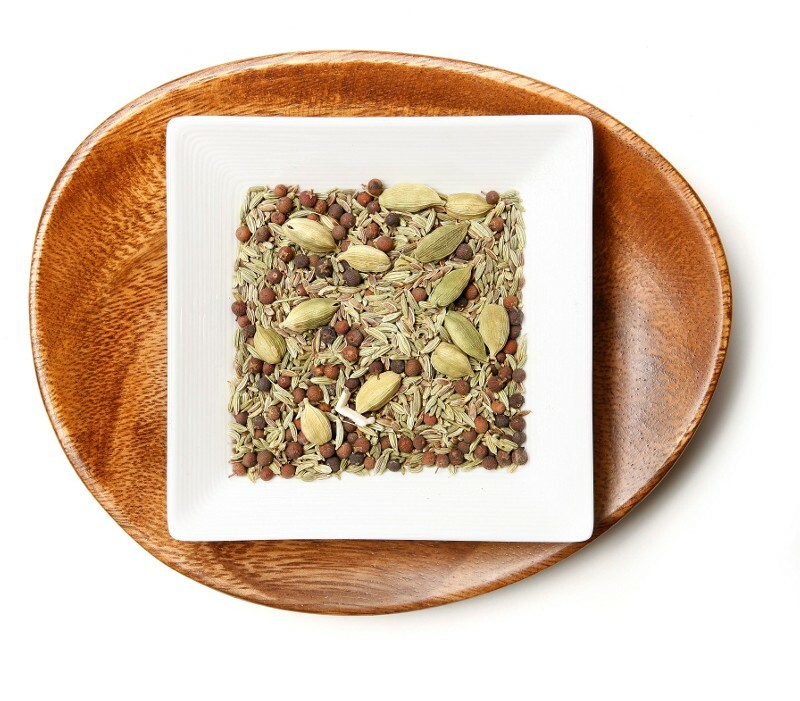 The rooibos base offers a hint of nutty/woody flavor, but, it iss barely distinguishable in the midst of the stronger flavors of licorice, fennel and peppermint. The lemon verbena is a soft citrus-y flavor that sits in the background and softens some of the sharper qualities of the other ingredients. The licorice, fennel and peppermint are the dominant flavors here, but as I said before the lemon verbena softens them somewhat, making this combination very palatable. It starts off with a sweet licorice-y taste, followed by the taste of crisp peppermint. The bright, lemony note arrives right before the finish and leaves a cool minty/citrus-y aftertaste. I like this best when served hot with a drizzle of agave nectar, but it’s not bad iced either. This is a tasty, soothing and very relaxing tisane. Nice! 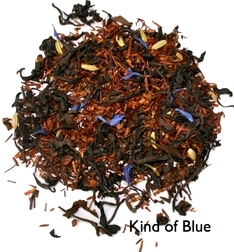 Take five to enjoy Kind of Blue, an irresistible blueberry Oolong jazzed up with fennel. Rooibos and Honeybush give blend a smooth finish while the Oolong gives the energizing boost. Improvise this tea with any meal or have it solo for an out of this world jam! This is really tasty. I was a little unsure about it, because I can’t recall trying an Oolong/Rooibos/Honeybush blend before, and I wasn’t sure how the three leaves would work together – but together they create one groovy vibe! This blend is unusual, but in a very good way. The Oolong lends its rich flavor to the cup as well as a smooth texture. The rooibos adds a little nutty flavor to the cup, as does the honeybush, plus there is an underlying note of honey-esque sweetness to the cup which melds very well with the blueberry flavoring. And every once in a while, just at the start of the sip, I’ll note a very slight hint of smoke. Just a hint – ever so slight – and one that can be missed when not paying attention. The blueberry flavor is not terribly strong here, and I really wouldn’t want it to be. I think it’s perfectly flavored, because a stronger blueberry essence would overwhelm the interesting balance that exists between Oolong, honeybush and rooibos, and I’m really enjoying the flavor and body of the cup just the way it is. Similarly, the fennel doesn’t add a lot of flavor to the cup – just a kiss of licorice-like taste that rests in the background – but any stronger and it would overpower the blueberry. This is a sweet tasting tea, but it is a pleasant sweetness – not at all cloying. It’s really delicious, and very different! In fact, this is one of the more difficult teas to describe that I’ve tasted, simply because it is so different. It has so many interesting flavors and textures throughout the sip that it is one that you need to try yourself to fully comprehend what I’m trying to express. And you really should try it – if for no other reason than it’s unique approach … but I think it’s worth a try because it’s really good! Also makes an awesome ICED tea! 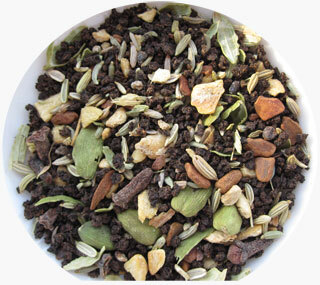 I have said this before: I love spiced chai blends. Well, many of them anyway. 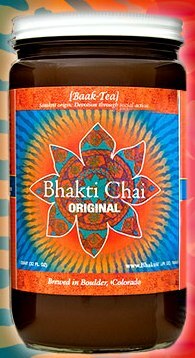 That being said, I am also biased when it comes to chai blends because I created my own Chai blend that I think is pretty remarkable. However, I do try to remain as unbiased as I can when I offer a review about a chai, because I want to be as fair and honest as possible concerning any tea. And now that I have decided to discontinue blending teas, I find that I enjoy other teas much more. Yogic Chai is one of my favorite companies because they provide exceptional customer service. When I deal with Yogic Chai, I feel like a person – an individual – and not a customer or order number. When I email them with a question, I get an almost immediate response (within an hour most of the time!) and it’s not some automated or cut-and-paste response. There’s a real person communicating with me. They treat me like a friend. I like that. 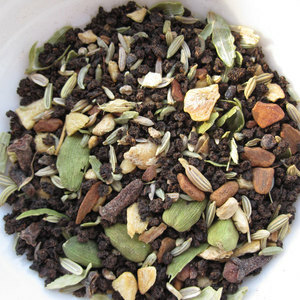 Yogic Chai focuses on what they do best – spiced chai blends – and they have the largest selection of spiced chai blends that I’ve ever seen from one company. From their Original Masala Chai (Black Tea, Cardamom, Cinnamon, Cloves & Ginger) to some rather unusual selections, including Wild Blueberry White Chai and Acai Berry Mate Chai, Yogic Chai proves that they have a passion for chai! They even have some interesting medicinal chai blends. This Fennel Masala Chai is (what I’m assuming to be) Yogic Chai’s Original Masala Chai with a heaping helping of fennel seed. The fennel adds a pleasing taste of black licorice to the cup. Sweet with just enough snap to it to make it a little less ordinary, the fennel is a very enjoyable addition to this chai. The black tea used in this blend is an Assam tea which is brisk and strong, but not so aggressive that it overthrows the flavor of the spices. There is some astringency, but not too much. It does get bitter if you over-steep it though, so I recommend a brewing time of 4 minutes or less. I found 4 minutes was just enough time to extract a pleasing flavor from the spices without that bitter bite from the Assam. Success! One thing I’ve noticed with Yogic Chai is that their chai spice blend is in good balance – not too much ginger, not too much cinnamon. I can taste notes of each spice without one spice getting all the attention. 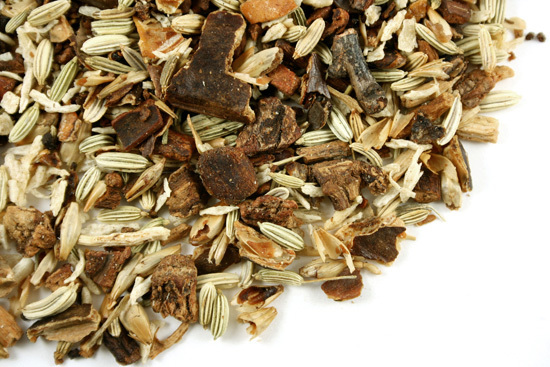 This is true of this blend as well, even though fennel is “showcased” by the name of this tea, it is not an overpowering taste, but instead, it falls in line with the other spices and becomes part of the blend. I prefer this particular chai blend with a dollop of honey but without steamed, frothed milk. I found that the milk off-set the taste of the fennel more than I wanted. It was still good “latte” style and I could still taste the fennel, but, there was less of that fennel taste that I really enjoy. So, with this one – try it first before you add milk! A must try for chai lovers!